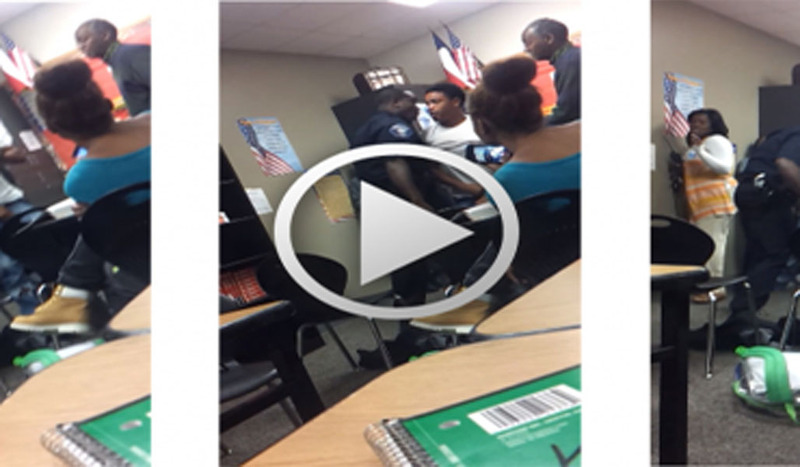 Jaw Dropping Video of Police Vs. Student Encounter. But the Media Isn’t Talking About This One. There’s been a lot of outrage lately about police officers and how they’re biased, how they have been abusing people as they stop them. This officer is like those officers, but no one seems to care. For those that will cry for extenuating circumstances, or that we don’t know what happened prior to, the officer had released the boy from a hold to pick the fight. This isn’t an officer defending himself, this is an officer that took his own aggression out on an already aggressive teen. Such behavior is not only unacceptable, it only promotes further like behavior from the kids affected. Now when Deputy Ben Fields was in an altercation with a student, the video showed evidence that the teen in question attacked him previously, and the media still came to his side. Now, here’s another officer with no clear evidence that he needed to release the teen, but it’s obvious he instigated further action. So, why hasn’t the media picked up the story? Why is there no public outcry to fire this officer? I’ll leave those for you to find the answers for yourself, but regardless of which side of the fence you’re on, this officer is definitely in the wrong.